This Waterpik Water Flosser review will highlight the features of a very important device that can impact your overall health. So pay close attention to the details. Your mouth acts as the controlling gateway to the health and wellbeing of your body, which is why dental health and oral hygiene are so important. Your dentist or dental hygienist has probably advised that you clean and floss your teeth regularly. However many people find flossing quite painful and uncomfortable. The Waterpik Water Flosser smartly harnesses the power of a water jet to clean food debris from between your teeth, removing harmful bacteria and keeping your mouth clean and healthy. 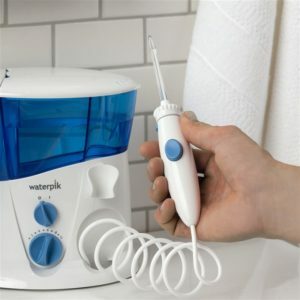 In this Waterpik Water Flosser review, you’ll see how it works, how it compares against other models, and why you might want to consider buying it. 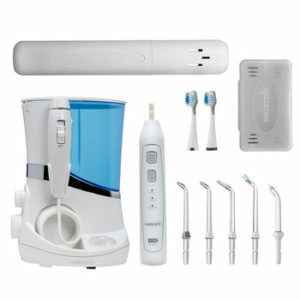 The Waterpik Water Flosser is used with a manual or electric toothbrush for flossing. While there is a Sonic toothbrush tip included in the pack, it’s best suited for a quick cleaning of teeth, and not really recommended as the best solution for dental care by itself. So choose from one of the best electric toothbrushes that are reviewed in detail on this page at ‘A Dentist’s Daughter‘. In combination, a good toothbrush and the Waterpik Complete Care Water Flosser will ensure you enjoy the best results, with a clean, pleasant feeling in your mouth. In just two weeks of regular use, you can have healthier gums, cleaner teeth and better hygiene. No matter the condition of your teeth and gums earlier, you’ll notice a significant improvement once you start using the Waterpik Complete Care Water Flosser . This instrument is capable of getting rid of over 99% of dental plaque, is twice as effective as string flossing, and comes with an array of tips to meet every reasonable need. And due to this factor, you’ll need a surface or shelf space in your bathroom, along with access to a power source. In fact, you’d be excused for thinking it looks like a piece of dental equipment, rather than something designed for home use. But if you ignore the size and appearance, you’ll soon discover that the Waterpik Complete Care Water Flosser really packs quite a punch in flossing efficiency. There is plenty of research data to confirm the results promised by Waterpik are not tall claims, but what really matters is how well it works for you. The instrument is white, with a smart blue water tank. Considering its size and purpose, the design is really pretty elegant and has gentle curves rather than sharp edges or hard lines. The flosser is easy to use . The power button, pressure gauge, and other parts are accessible and simple to operate even for people with limited movement of hands, or when your fingers are wet and slippery. The water tank can hold 600 ml. which is enough water for 90 seconds of flossing. It can be dismantled, emptied and refilled easily. You can choose to use cold or lukewarm water, and have the option of adding some mouthwash if desired. The different tips are conveniently stored in a space provided in the lid of the tank itself. This is convenient and useful, making the tips easily accessible to replace and remove whenever needed. However, most users will not need all 5 tips. You can pick the one that best meets your needs, and attach it to the device. If many different people will use the same Waterpik Water Flosser, then it has to be quick and easy to replace heads/tips with a click and release design. All you have to do with the Waterpik Complete Care Water Flosser is push the tip into a hole on the upper end of the handle, until you hear a clicking noise that confirms the tip is locked into place. When you want to remove a tip that’s attached, press on a small blue button that’s on the left side of the handle and pull on the tip. It will come out with a slight jerk. With the tip attached and the water tank filled, switch on the power to the Waterpik Water Flosser and adjust the pressure setting knob to your preference. A lower number indicates lesser pressure. For instance, 1 delivers the least pressure which is ideal for users with sensitive teeth and gums. A setting of 10 is the most powerful. The machine is quite noisy while operating, as compared to an electric toothbrush . Some first-time users find this disconcerting and it can take a while to get used to it. The water flosser’s handle attaches to the machine through a tiny white hose that can be tucked away inside the flosser itself while not in use. You’ll have to pull it out, stretch it to extend reach and then connect it to the handle or tip. The length of the hose is around 100 cm. The flosser handle is elliptical and fits snugly and comfortably into your hands. A large button, pale blue in color, is what regulates the water power. Once you flick the switch on, water flows from the tip. By pressing and holding the control button on the handle, you can stop or start the release of flow. The tip can be rotated by 360 degrees. It has convenient ridges that let you get a firm grip on it to rotate. However it does take some manual dexterity to make all these adjustments while flossing. It is helpful to have a long tip that lets you reach into all areas inside the mouth, including behind the last molar teeth. But until you learn to control the device better, be prepared for a little spillage and wetting the floor. Just as using an electric toothbrush for the first time, it may take a week or two before you work out a routine that suits you. Adding a little mouthwash to the water thank can lend some zing to your flossing and leave your mouth feeling fresher and cleaner after a floss. The choice of different tips is great, and will make it easier for users who wear braces to floss without the need for multi-sized small brushes to clear food debris trapped inside crevices that are hard to reach otherwise. A water jet from the Waterpik Complete Care Water Flosser can make this simpler and faster. The Waterpik Water Flosser needs a power source to operate, and it can’t run off batteries. So you’ll need a socket to connect it to within the range of 2 meters. Most users keep the Waterpik Complete Care Water Flosser in the bathroom, where usually there’s a single power socket which is also used for shavers and other devices. So it might be a minor inconvenience to connect and reconnect the flosser during use. The power cable of the Waterpik Water Flosser is around 130 cm long and so it can be located in a convenient spot in your bathroom. The charger and cable are both white. 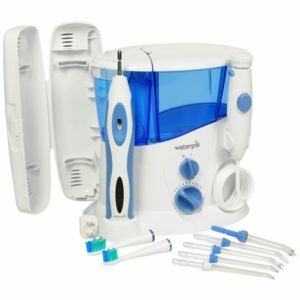 Where To Buy the Waterpik Water Flosser? This popular device can be purchased in offline retail outlets like Boots, Walmart and Target as well as from e-commerce portals online. The most popular among these is Amazon , where you’ll likely get the best deal because of frequent coupons and discount offers. Considering that you will incur no additional costs except for electric power to run the flosser, the one-time cost is reasonable. There are certainly other options available, at other price points, but they vary in features and advantages. As compared to the cost of string flossing, the Waterpik Water Flosser is a little more expensive, but it lies on the less expensive end of the spectrum of similar devices. The longer you use it, the more cost effective your purchase will be. And the 3 year warranty ensures that you’ll at least get 36 months value from it. Many Waterpik Water Flosser reviews state clearly that the product is reliable and no major problems were noticed in testing periods that lasted as long as 6 weeks. The design and construction are of high quality. Maintenance is easy and hassle-free. If you intend to leave the flosser unused for a while, it’s best to rinse it with water now and then to keep it in working order. Avoid stagnant water in the device for long. An important precaution to follow is to make sure the tank has water before turning the Waterpik Water Flosser on. Running it on empty can damage the component parts. Another potential problem is that the connecting hose may become loose and lax, with resulting loss in water pressure when you floss. 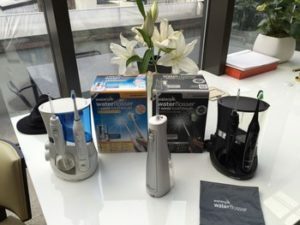 This Waterpik Water Flosser review focuses on the pros and cons of a device that some readers might consider overkill. After all, string flossing works quite well. So why bother with a device to do this? A good reason is that the Waterpik Water Flosser delivers a better cleaning experience , especially for those with sensitive teeth and gums. Using water for flossing is not only more pleasant, it also leaves you with a cleaner feeling. The adjustable settings for pressure and the range of tips available with this model make for a winning combo. Major drawbacks are the noisiness and the need for a power socket which may not be available in all bathrooms. But if you’re serious about clean teeth and looking for a solution that works with sensitive teeth and gums, you could do well with the Waterpik Water Flosser . Effective Plaque Removal: The Waterpik Water Flosser is clinically proven to remove over 99% of dental plaque from areas where you floss regularly. Healthier Gums: Users have reported over 50% enhancement in gum health versus traditional string flossing. Better Than Manual Toothbrush: Repeated studies have demonstrated a proven advantage over using a manual toothbrush for improving gum health. With the Waterpik Complete Care Water Flosser, you have a solution for all your brushing and flossing needs with one convenient device. Using a unique combination of pulsating vibrations and pressurized streams of water, the Waterpik Water Flosser ensures deep cleaning between teeth and along the gumline. It effectively removes food debris and harmful bacteria. By relying upon water jets rather than string or other physical objects to remove particles, the Waterpik Water Flosser is ideal for anyone wearing braces, or having implants, crowns and periodontal pockets. The device is easy to use. All you have to do is fill the reservoir with water, point the tip at your gumline, and floss. If you suffer from sensitive teeth or gums, use warm water or add an antiseptic mouthwash. You get an effective brushing and flossing solution in a single convenient device. The flosser removes plaque and debris deep in the crevices between teeth and below the gumline, including areas not easily reached by brushing and traditional flossing. It has a high volume reservoir that has enough capacity to maintain flossing for 90 seconds or longer. The toothbrush cleans by sonic technology, and delivers 25% higher speed of bristle vibrations than other sonic toothbrush models. It saves space with an ergonomic design, requires only one power outlet, and has a tip that can rotate 360 degrees for a complete wash. The included sonic toothbrush has a rechargeable battery and a choice of two brush heads that can be interchanged. The toothbrush has a timer with quadpacer and a premium travelling case is included. 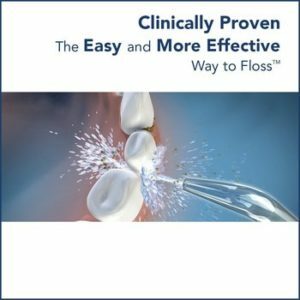 Hopefully this information has helped you learn all about the Waterpik Complete Cure Water Flosser . You are now in a position to make an informed choice about whether or not the flosser is right for you. If you have any further questions or doubts, please leave a comment below.